Have you book your trips for May to June 2017 trips? You might want to check the new Philippine Airlines seat sale May to June 2017! Affordable round trip tickets to select domestic destinations are offered by PAL to its clientele this weekend. Cheap flights are good for summer trips. Routes on sale are the Manila to Zamboanga, Manila to Ozamiz or Manila to Roxas. 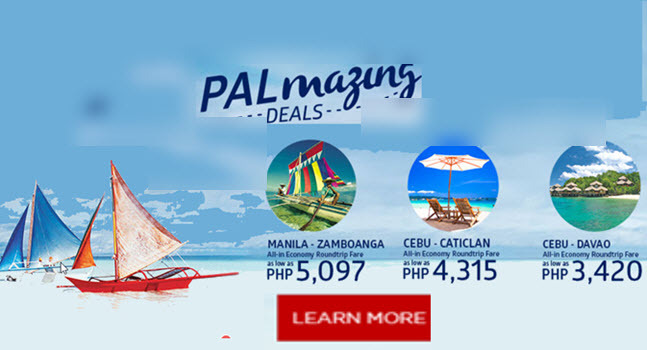 From Cebu, flights to Kalibo, Caticlan or Davao are on promo as well. Travel period for this promo runs from May 23 to June 7, 2017. Promo period is until May 14, 2017. Sale tickets are limited, book your tickets fast! Quoted PAL promo tickets are valid for round trip travel. However, you can book for one-way trip. Fare inclusions are airfare, taxes, fees and charges. Your Philippine Airlines promo ticket cover free light snacks, 7 kilos cabin baggage and 10 kilos checked baggage allowance. Get the PAL low fares by booking online at www.philippineairlines.com, via your mobile device or reserve your tour package at swingaround.philippineairlines.com. By booking your trip + hotel with PAL swing around, you will earn triple Mabuhay Miles. Will you be traveling with an infant? Airfare of infants without seat is 10% of adult fare. You don’t have a credit card? No worries, payment of PAL tickets can be made via accredited Payment Centers such as Bayad Center, 7-Eleven, SM Bill Payment Center, EC Pay, Cebuana Lhuillier, M Lhuillier, Robinson’s Department Store. So, what are you waiting for? Reserve the amazing and affordable Philippine Airlines promo fares now! Do you need more promo fares? Like us in Facebook: PISO FARE TICKET to receive updates on Philippine Airlines, Cebu Pacific and Air Asia promo fares and PISO FARE 2017 to 2018!! !